In the early 1900s, it was the largest city between St. Louis and San Francisco, bustling with the raw material of Wild West legends. 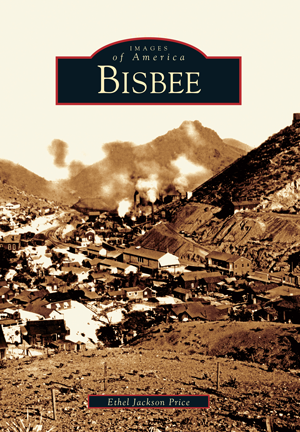 Bisbee's infamous Brewery Gulch once supported 47 saloons and was considered the "liveliest spot between El Paso and San Francisco." By the 1970s, opportunists had relieved Bisbee's Mule Mountains of billions of pounds of copper, 102 million ounces of silver, 2.8 million ounces of gold, and millions of pounds of zinc, lead, and manganese. The ore reserves were depleted, and when the last pickaxe struck plain old dirt, a mass exodus of miners collapsed the real estate market. But the lure of cheap land was a magnet for retirees, hippies, and artists. Boarding houses were converted into charming bed and breakfasts. Antique stores, galleries, cafes, and restaurants replaced the saloons. These days, a vibrant and eclectic community of ranchers, politicians, and free spirits; a well-preserved architectural and historic heritage; and "the most perfect year-round climate" make Bisbee, the county seat, a one-of-a-kind gem. In this engaging retrospective, showcasing more than 200 archival photographs from private collections and the Bisbee Mining & Historical Museum Society, author Ethel Jackson Price sifts through the rich history of the boomtown that simply refused to go bust.